The continuing chill in the hills of Darjeeling has affected the first-flush tea output in March, with planters estimating this year’s production to drop by a fifth. These premium teas, which is part of the season’s earliest harvest have robust demand in Japan, Germany, France, and the United States. Darjeeling tea exporters said that while the output drop could still be made up in April if the weather improves. A stronger rupee has become a concern as price realisation would decline. The rupee has appreciated against the dollar in the past one month and closed at 69.16 to a dollar on Friday. It had fallen below 74 to a dollar last autumn. Darjeeling has witnessed snowfall this year after almost a decade. It snowed on December 28 last year and again on January 29 this year. “The arrivals at the auctions are less this year due to a drop in production in March,” said J Kalyanasundaram, secretary, Calcutta Tea Traders Association (CTTA). Prices of first-flush Darjeeling teas entering the markets this year have jumped about 40% at private sales on improved quality and strong overseas and domestic demand. 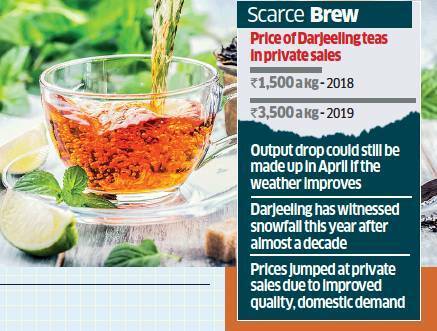 In early March, Darjeeling teas had fetched Rs 3,500 per kg against Rs 1,500 a year ago in private sales. These were first-flush teas from lower elevation gardens, although supplies were not plentiful. Industry executives said that a Tea Board order on October 31, 2018, to close gardens by early December seems to have paid off. Venture capital-backed Teabox has sold the heritage moonlight spring white tea from Badamtam tea estate at Rs 2 lakh per kg to US buyers. Traders said foreign buyers, especially from Germany and the UK, have entered into forward contracts with planters. “But the appreciation of the rupee is eating into our revenues even though overseas buyers are giving a little higher price than they did last year,” said Bagaria. Darjeeling tea exporters said that while the output drop could still be made up in April if the weather improves. A stronger rupee has become a concern as price realisation would decline. T ..